Postcards of houses are not easily found. And when they are found, the pictured house is often unidentified or has been demolished. Relatively few house postcards were published, probably because most folks preferred sending a postcard of a public building rather than a private dwelling. Only homes which could attract enough interest, either because of their architecture or their owner’s fame, were saleable to the public. In a few examples, proud owners would privately commission a postcard of their home. This postcard feature a prominent and well known house. Not only is the house still standing but it is completely recognizable. 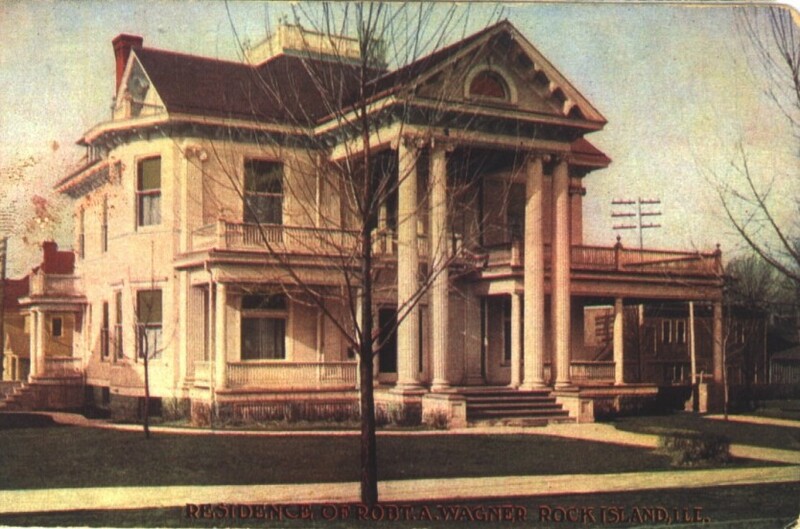 The residence of Robert A. Wagner, on the corner of 23rd Street and 9th Avenue in the Broadway Historic District, is an official Rock Island Landmark as well as being listed on the National Register of Historic Places. The original name for 23rd Street was Broadway. This early 20th Century postcard shows the home built for Robert Wagner and his wife, Thekla. Robert was the son of George Wagner, a German native who acquired Rock Island’s Atlantic Brewery in 1865. After college, Robert joined his father in the brewing business and, in 1892, became president of the Rock Island Brewing Company. That was the name given the new company that resulted from the merger of Atlantic with the Huber Brewery and the Raible and Stengel Brewery. Mr. Wagner was also an active participant in the Rock Island banking community. In 1905, the Wagners moved into their new home at 904 23rd Street. It was designed in the Neo Classical (also called Classical Revival) style by Davenport architect Frederick Clausen. Important elements of the style include the elaborate two-story entrance portico with massive fluted columns and the balustraded balconies that extend over the porte cochere. Each post supporting the balustrade is topped by a finial. Notice the front house corners, where two-story square columns that mimic the round freestanding ones are placed flat against the wall. These are called pilasters. The postcard accurately shows the house simply painted in white, relying on its architectural detailing for light and shadows that create visual interest. Classical Revival houses were nearly always painted white. One explanation is that the white color was a reaction to the multicolored paint schemes popular on many Victorian homes of preceding decades. Another reason is that this elegant style was an echo of the 1893 Columbian Exposition in Chicago. That World’s Fair assemblage of classically styled buildings, known as the White City, influenced architecture for decades. One remnant of the fair that can still be seen is Chicago’s Museum of Science and Industry, the former Palace of Fine Arts. Robert Wagner died in 1937, but Thekla remained in the home until her death in 1956. Comparing the postcard with the home today we see only one architectural difference, a missing “widow’s walk” atop the roof. You will have to drive by the Wagner house to see some of the things the postcard does not show, especially the windows, including those made of stained, beveled, and “bottle bottom” glass. The imposing entry doors have the Wagners’ “W” etched into a medallion in the center of the glass. The interior of the Wagner House is largely unchanged as well. The Wagners had no children and the layout reflects that — it contains only two bedrooms. Other upstairs rooms, which in most houses would be bedrooms, were very specifically designed as a library, maid’s room and sitting room. The scale and layout of the main floor are ideally designed for entertaining on a large scale, as would befit a family of the Wagners’ standing in the community. The magnificent condition of the home today is a result of continuing maintenance and restoration although the original white color was more recently changed to yellow. Porch balustrades have been recreated and restored, but the remainder of the exterior is original. Even the Wagner’s original garage, a delightful little one-car affair detailed with fanlight windows, is still in use. This article by Diane Oestreich is slightly modified from the original, which appeared in the Rock Island Argus and Moline Dispatch on July 21, 2002.